Infrared wireless headphones can be used for listening to video, television or radio cordlessly which is it can employ infrared technology to transmit a signal from a source component to the application device. 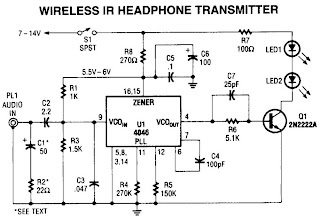 Wireless is a process of power or information transfer from one points to another points or multiple points that are not connected via any wire connection. The Basic of wireless technologies use radio waves. 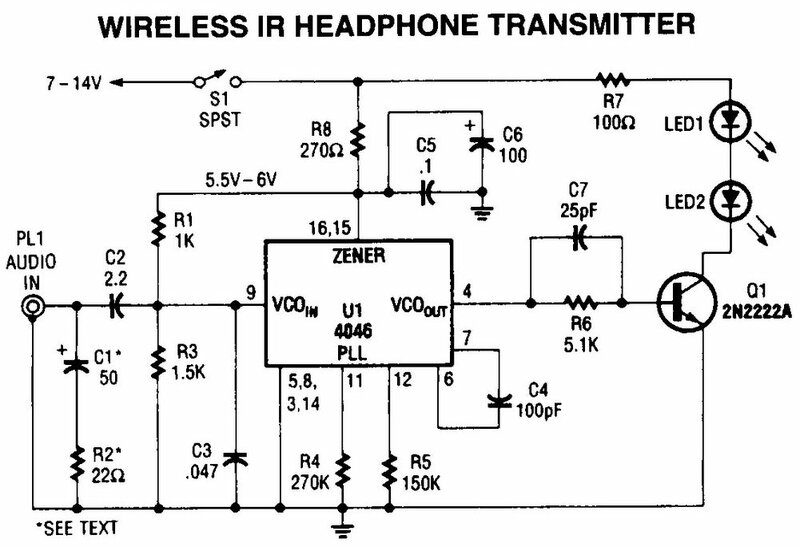 This circuit shows a Wireless Transmitter for IR Headphone. Audio input from PL1 frequency modulates the VCO section of a 4046 PLL chip. The VCO output drives Q1, a switching transistor. Q1 drives two IR LEDs. The signal produced is around 100 kHz, FM carrier VCO sensitivity is around 7.5 kHz/V.